The domain within your query sequence starts at position 3300 and ends at position 3345; the E-value for the ZnF_ZZ domain shown below is 7.39e-18. 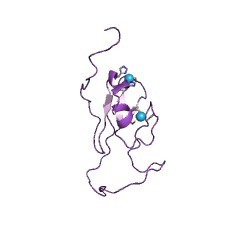 Zinc-binding domain, present in Dystrophin, CREB-binding protein. Putative zinc-binding domain present in dystrophin-like proteins, and CREB-binding protein/p300 homologues. 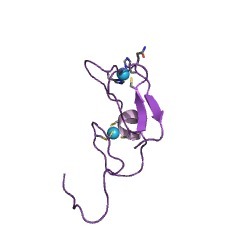 The ZZ in dystrophin appears to bind calmodulin. A missense mutation of one of the conserved cysteines in dystrophin results in a patient with Duchenne muscular dystrophy . Transcription factors P300 and CBP. 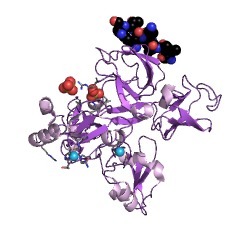 Plant proteins involved in light responses, such as Hrb1. 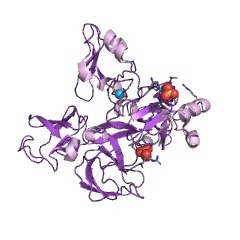 E3 ubiquitin ligases MEX and MIB2 (EC 6.3.2). 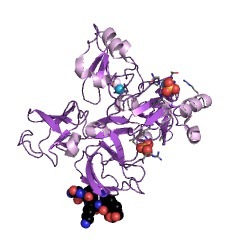 Single copies of the ZZ zinc finger occur in the transcriptional adaptor/coactivator proteins P300, in cAMP response element-binding protein (CREB)-binding protein (CBP) and ADA2. 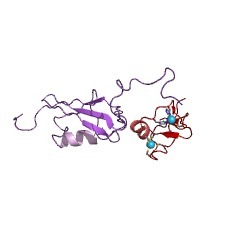 CBP provides several binding sites for transcriptional coactivators. The site of interaction with the tumour suppressor protein p53 and the oncoprotein E1A with CBP/P300 is a Cys-rich region that incorporates two zinc-binding motifs: ZZ-type and TAZ2-type. 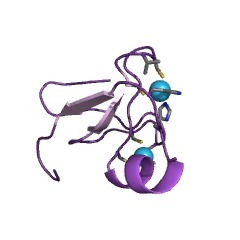 The ZZ-type zinc finger of CBP contains two twisted anti-parallel beta-sheets and a short alpha-helix, and binds two zinc ions [(PUBMED:15476823)]. One zinc ion is coordinated by four cysteine residues via 2 Cys-X2-Cys motifs, and the third zinc ion via a third Cys-X-Cys motif and a His-X-His motif. The first zinc cluster is strictly conserved, whereas the second zinc cluster displays variability in the position of the two His residues. In Arabidopsis thaliana (Mouse-ear cress), the hypersensitive to red and blue 1 (Hrb1) protein, which regulating both red and blue light responses, contains a ZZ-type zinc finger domain [(PUBMED:15705950)]. 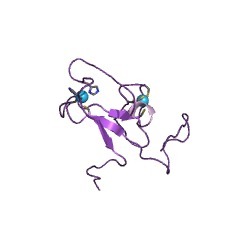 ZZ-type zinc finger domains have also been identified in the testis-specific E3 ubiquitin ligase MEX that promotes death receptor-induced apoptosis [(PUBMED:16522193)]. MEX has four putative zinc finger domains: one ZZ-type, one SWIM-type and two RING-type. The region containing the ZZ-type and RING-type zinc fingers is required for interaction with UbcH5a and MEX self-association, whereas the SWIM domain was critical for MEX ubiquitination. In addition, the Cys-rich domains of dystrophin, utrophin and an 87kDa post-synaptic protein contain a ZZ-type zinc finger with high sequence identity to P300/CBP ZZ-type zinc fingers. In dystrophin and utrophin, the ZZ-type zinc finger lies between a WW domain (flanked by and EF hand) and the C-terminal coiled-coil domain. Dystrophin is thought to act as a link between the actin cytoskeleton and the extracellular matrix, and perturbations of the dystrophin-associated complex, for example, between dystrophin and the transmembrane glycoprotein beta-dystroglycan, may lead to muscular dystrophy. Dystrophin and its autosomal homologue utrophin interact with beta-dystroglycan via their C-terminal regions, which are comprised of a WW domain, an EF hand domain and a ZZ-type zinc finger domain [(PUBMED:17009962)]. The WW domain is the primary site of interaction between dystrophin or utrophin and dystroglycan, while the EF hand and ZZ-type zinc finger domains stabilise and strengthen this interaction. There are 21616 ZnF_ZZ domains in 18218 proteins in SMART's nrdb database. Taxonomic distribution of proteins containing ZnF_ZZ domain. This tree includes only several representative species. The complete taxonomic breakdown of all proteins with ZnF_ZZ domain is also avaliable. Click on the protein counts, or double click on taxonomic names to display all proteins containing ZnF_ZZ domain in the selected taxonomic class. This information is based on mapping of SMART genomic protein database to KEGG orthologous groups. Percentage points are related to the number of proteins with ZnF_ZZ domain which could be assigned to a KEGG orthologous group, and not all proteins containing ZnF_ZZ domain. Please note that proteins can be included in multiple pathways, ie. the numbers above will not always add up to 100%.